Place your fingertips on the blue keys, as in the picture. 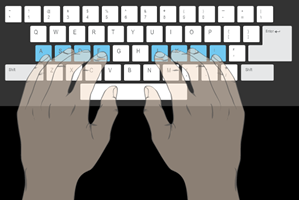 This is the basic position for touch typing. You can find this position without even looking at the keyboard. Feel the bumps on the F and J keys, and place your "pointing" finger of each hand on those keys. From here it is possible to easily reach all the other keys. For example, the finger on the letter "D" is used for the letters "E" and "C." The finger that rest on the "F" can also reach "R-T-G-B," and "V."
As you learn to type, look under the text box to see which finger to use. Don’t be afraid to make a mistake – if you do, we will show you the correct finger to use. For starters, you will learn to type just letters. When you get to lesson 15, you will be typing words and sentences that have meaning. Practicing typing sentences that have meaning is very important for you to be successful at typing! You can easily make your own lessons beyond lesson 15 by copying a section of text from any website or file. The text should be pasted into the white text box (you can copy and paste text by selecting the desired text and right-clicking your mouse). Accuracy and speed are the two measures of a good typist. It will be helpful to you to measure your speed periodically as you practice.